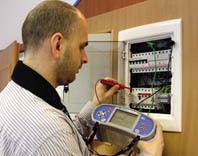 As customers become more aware of their rights and business owners become more aware of their obligations to both customers and employees (who must sign off on work carried out), fail-safe multifunction electrical testing instruments that speed up testing, store test results and print actual test results that guarantee accountability and traceability are fast becoming essential. Under Electricity Regulations, the testing and certifying of completed work to AS/NZS3000 is mandatory, but often not carried out because traditional methods are so time consuming. Consider a large installation with hundreds of socket outlets that should be tested prior to being energised. Compliance testing in such a situation typically takes days, making compliance testing very expensive. Recognising the need for such an instrument, Emona Instruments, in partnership with Metrel, in mid-2005 began to specify and to develop a customised installation tester for Australian requirements. 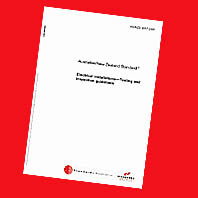 Released almost 12 months later, the InstalTest 3017 has been designed specifically for Australian wiring and Australian Standards, and has revolutionised electrical testing in Australia. In Europe neutral and active can be transposed. That's why testers designed for European Standards cannot easily conduct the mandatory Australian test: "Correct Circuit Connections". The InstalTest includes this test with in-built Pass/Fail limits both as a single test and as part of auto-sequence tests for lighting points and socket outlets tests. For the first time, the InstalTest 3017 gives contractors a more practical way of testing and certifying completed work to AS/NZS3000. This guarantees higher productivity and profitability for the contracting business, better compliance to standards and regulations, and improved overall electrical safety. Traditional multifunction testers are based on European IEC 60364 and British HD 384 standards. That's fine if you are testing in Manchester or Munich, but not so helpful if you are testing in Melbourne to AS/NZS3000 and Victorian EnergySafe's Code of Practice on Low Voltage Electrical Installations. The InstalTest 3017 is programmed with the Pass/Fail limits, test parameters and tables found in AS/NZS3017 Electrical Installations - Testing & Inspection Guidelines. For example, the InstalTest's Pass/Fail feature is indispensable in fault loop impedance testing. Often regarded as a complicated test, the user simply selects the required variables from the pull-down menus, i.e. Protective Device, Type, Device Rating, Conductor Size for Active and Earth and performs the test. The instrument indicates a Pass/Fail result. Users no longer have to look-up AS/NZS3017's Table 3.2 "Maximum Values of Resistances". Unlike traditional multifunction testers, the InstalTest 3017 is also supplied with the essential accessories to conduct tests to AS/NZS3017 such as a Resistor Box for polarity and circuit connection tests on socket outlets and lighting points. The InstalTest 3017 conducts all of the tests and inspections required under AS/NZS3000: Voltage, Visual Inspections, Earth Continuity & Resistance, Insulation Resistance, Polarity, Correct Circuit Connections, Fault Loop Impedance and RCD Verification tests. Users can choose tests with fixed parameters and limits, or user defined parameters and limits. Where AS/NZS3017 requires specific test parameters and limits, the InstalTest is pre-programmed with the compliant test settings. For example the "Earth Continuity & Resistance: Main Earthing" test is set to a 200mA with 0.5ohm Pass/Fail limit. Pass is indicated by tick and Fail is indicated by cross. In addition, the InstalTest can be used as a voltmeter, insulation tester, loop impedance tester and RCD tester for troubleshooting and general electrical work. Traditional multifunction testers conduct single measurement functions only. The InstalTest introduces the concept of "Auto-Sequence Testing". An auto-sequence is several single tests grouped together to carry out particular task. 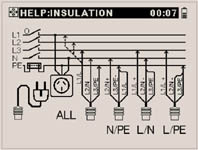 Examples of auto-sequence tests include "Metallic Switchboard Enclosure", "Aerial Conductor", "Lighting Point" or "Socket Outlet". Each auto-sequence has pre-defined Pass/Fail limits and the tests are conducted in the sequence specified by AS/NZS3000 and AS/NZS3017. For example to test a "Socket Outlet", choose "Socket Outlet" from the auto-sequence menu, plug the mains measuring cable into the socket under test and the InstalTest automatically sequences through earth resistance, polarity and correct connections tests. Sequence testing is particularly effective for carrying out testing and certifying of completed work, for example testing and certifying hundreds of socket outlets and lighting points on a large new installation using traditional methods is extremely time consuming. The InstalTest provides the fastest and most practical way of meeting the mandatory test requirements of AS/NZS3000, OHS and electrical safety regulations. Traditional installation and multi-function testers are operated via a rotary switch. The InstalTest features a full graphical display with pull down menus for measurement parameters, help screens with connection diagrams and user prompts for test connections or inspections. The screen also displays "Warning -Live Conductors" messages when carrying out supply available tests, a particular benefit that improves operator safety. Another advantage of a graphics display is that functions can easily be edited or added if standards or regulations change. Most contractors are already familiar with providing Compliance Reports for data cabling work. However, no one was ever injured or killed by a non-compliant data cable! Compliance test reports for electrical work are not only essential but make good sense. The InstalTest stores results, download to PC software and print Safety & Compliance Test Reports with user name, license number, switchboard, sub-boards and articles locations and test results. This provides users with a complete installation compliance management system, allowing contractors provide a professional report of test results to the installation owner/occupier and maintain PC based records for required statutory period.